With almost 30 years of experience we consider ourselves experts in framing! Sea Needles has framed award-winning pieces. We can advise in framing your treasured item and are happy to assist you in choosing mats and frames. We are specialists in total conservation framing of all artwork including photographs, prints, original art and oil paintings and needlework. Shadowbox framing of dimensional objects and memorabilia is available. Choose from a variety of wood, metal, ornate or simple quality frames. We stock readymade frames up to size 11x14. 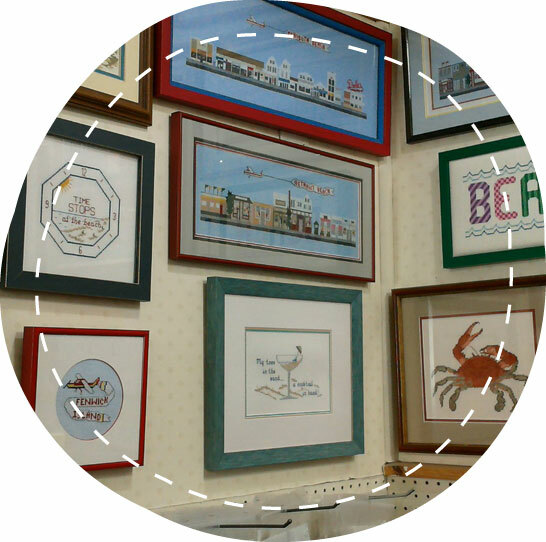 We are specialists also in framing and blocking counted cross stitch, needlepoint or any other stitched needlework. The picture to the left shows our framing of some of our exclusive cross stitch kids. Remember Sea Needles for creative and unique custom framing!